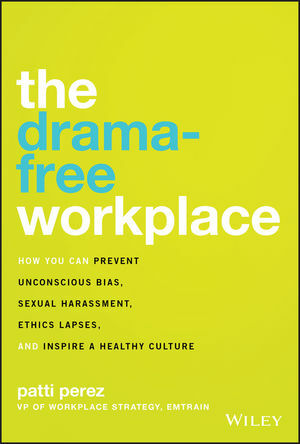 Eliminate sexual harassment, unconscious bias, ethical lapses and other HR nightmares! Companies spend millions on legal compliance training and initiatives to eliminate workplace drama and the resulting low morale and lawsuits, but don’t always get the results they want. Most organizations understand that simply checking legal compliance boxes around sexual harassment, bias, etc. isn’t enough, but are at a loss on how to implement solutions, especially in today’s post-#MeToo world. investigate and resolve claims of sexual harassment and other types of misconduct. Together, these practical tools will help all your employees feel valued and motivated, and keep drama, disengagement, and lawsuits, away. patti perez is Vice President of Workplace Strategy for Emtrain, a technology-driven HR culture/compliance company and a frequent speaker around the United States and Latin America on sexual harassment prevention and other workplace issues. She is a licensed California attorney, a professionally-certified HR executive, and a specialist in the prevention and resolution of workplace drama.